In 1894, 214 people lived in Rainy Lake City. It smelled of fresh-cut timber, canvas tents, and muddy streets. 11 of the people living there were women and the town had 16 saloons. Three years later, the population had grown to 500. Ten years later, the town didn’t exist. It was Little American Island’s fault. A prospector named George W. Davis found quartz flecked with gold on the island and sent samples back to his partner in Duluth for testing. The news filtered through the saloons and down to Minneapolis and beyond. “There’s gold on Rainy Lake,” people said. I floated in the water wondering why Voyageurs National Park had a sign on a random island in Rainy Lake. 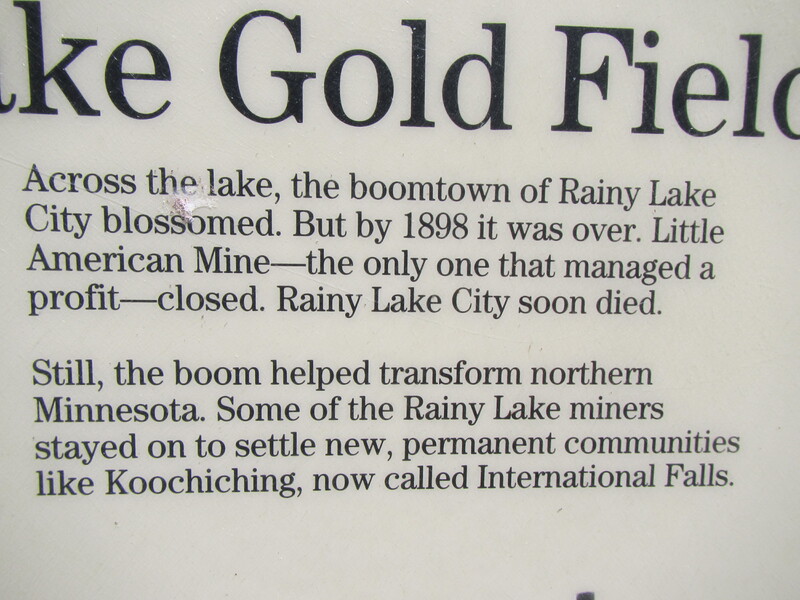 I’d never heard of a gold rush or Rainy Lake City. I didn’t know I was staring at the island that started it all. Rainy Lake City sprung into existence overnight, held together with timber, tents, and dreams. Stories fed the excitement. People said the barber panned his customer’s hair for gold and bell boys swept flakes off the floor. I hoped out and plunged into the heart of a hundred stories about the Rainy Lake gold rush. The mine on Little American Island started the rush and was the only one that ever made a profit, but gold fever churns out stories. “One-Armed” Sullivan could shoot well with his left hand, but not well enough to survive a dispute one night in a saloon. “Gold Bug” Jimmy Dunn used to fire a shotgun filled with powder and gold flakes into mines then sell the salted claims to hapless investors. W.W. Butler, the town’s banker, may or may not have robbed his own bank, depending on which half of the town you asked. When the gold slowed then stopped, so did the town. People moved some of the buildings to what is now International Falls, the rest rotted away and disappeared into the forest. There’s hardly anything left, just a few old shafts and some equipment left to rust when the mine closed, but it’s there if you look. Just give it five minutes. Posted in Angle to Key WestTagged AKW July, Angle to Key West, exploring, five minutes, gold, Rainy LakeBookmark the permalink.